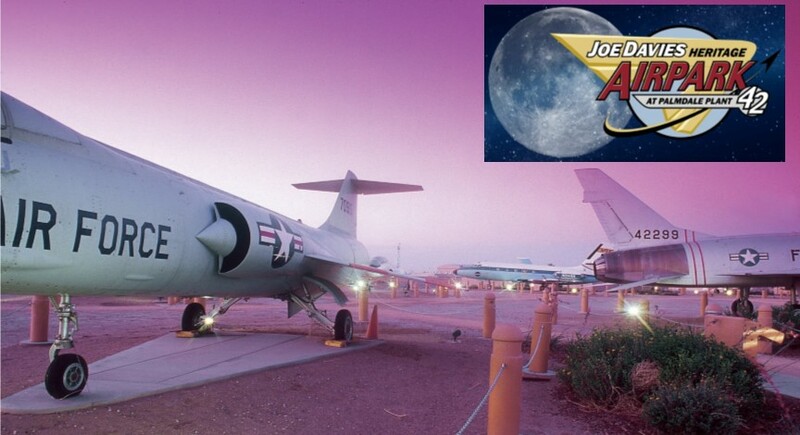 PALMDALE – The City of Palmdale’s Joe Davies Heritage Airpark will host a Full Moon Tour and A Night of Pokémon this Thursday, March 21. It’s happening from 6 to 10:30 p.m. at the Airpark at Palmdale Plant 42, located at 2001 Avenue P. Admission and parking are free. For more information, call 661-267-5611. Joe Davies Heritage Airpark at Palmdale Plant 42 is a family friendly, uniquely Palmdale destination centered around displays of aircraft that portray the rich aerospace heritage and present the historical significance of United States Air Force Plant 42 in a way that generates pride among residents and prestige among peers. Visitors to Joe Davies Heritage Airpark may view a collection of aircraft flown, tested, designed, produced or modified at United States Air Force Plant 42. The airpark includes 21 retired military aircraft on static display, plus a 1/8 scale model of the B-2 Spirit, an AGM-28 Hound Dog Missile, a B-52, a C-46, and various aircraft components. When fully developed, the airpark will showcase over 40 retired military and civilian aircraft. For more information on Joe Davies Heritage Airpark, visit www.cityofpalmdale.org/airpark. 1 comment for "Full Moon Tour & A Night of Pokémon coming to Airpark this Thursday"
Will there be any security?